This is an old review but one that I think needs to be posted. I was reading the blog of A Picky Girl and a question came up regarding books that preach so much that even though you agree with the message, you end up wanting to throttle the author. Those are my words, not hers. She was much kinder about it. This afternoon I finished one of the most aggravating left-leaning books I’ve read. 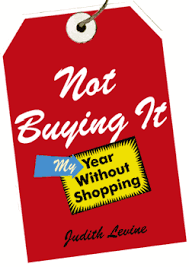 I’m speaking of Not Buying It: My Year Without Shopping by Judith Levine. Judith decides she participates too much in the economy. Her and her ‘life partner’ Paul decide to spend one year making only ‘necessary’ purchases. I am not against this idea, in theory, but Judith is just plain annoying. Her ‘necessity’ list includes $25 premium coffee, several $100+ clothing purchases and $85 haircuts. She ‘fucks up’, as she puts, it at least once a month and buys something she’s not supposed to. Of course, no one is perfect. It’s a difficult thing to do, not buying anything. But you’re writing a *book* about it! If you’re going to write a book about not buying things, DON’T BUY THEM! Or call the book Sort of Not Buying It : The Year I Made an Attempt to Not Buy Anything But Couldn’t Manage to Do It. She goes off on these random unrelated political rants that are like reading a 13 year old tell you why they’re a repub or dem – she’s just spewing party line talking points and gets called out several times by opposing views. Each time this happens she gets mad, then whines and inevitably ends up in tears. I have been in more than my fair share of political debates and I can tell you – I’ve never cried. I’ve never wanted to cry, I’ve never been on the verge of crying. You know why? I can back my opinions up! I don’t get slammed by educated people and end up looking stupid. Not to mention the whole inherent hypocriticalness of trying to get people to buy something to show them how not to buy things. By the way – this book was a gift. I did not buy it. I don’t need to know how to not buy things. It’s like buying, but the opposite. Anyway. The point is that I think there’s a really valid point or two to be made about what she’s doing – but not by a woman who owns *three* cars. Yes, three cars. And she spends a good 10 pages trying to justify this (one is for winter, one is for summer and the third is a truck she claims in the beginning is in ‘almost non-working order’ and only used to haul firewood from a few miles away – then towards the end she’s driving the truck 4 hours to buy a $300 bathtub from some guy’s barn). Judith, you’re not fooling me. You’re trying to lose some of that middle class guilt, I get it. I’ve got it too. But spending your weekends volunteering and actually helping people seems like a better plan that writing a self-congratulatory book on something you didn’t even accomplish. This entry was posted in book reviews, non-fiction and tagged awful, book review, levine, non-ficiton. Bookmark the permalink. Haha! You are hilarious. The dude writing this book doesn’t cry; he’s too self righteous for that. I can tell he’s older and very definitely feels this stuff, but it’s like being told off for being born. Gah! Needless to say, I haven’t picked it back up, which is a shame as I really want to read it. I guess it’s having to read books like this that would make being a book reviewer work. I’m with you, spending her weekends volunteering and helping people would be a much better plan, since I assume that a book about not buying things would include discussions of better things to do with your time.